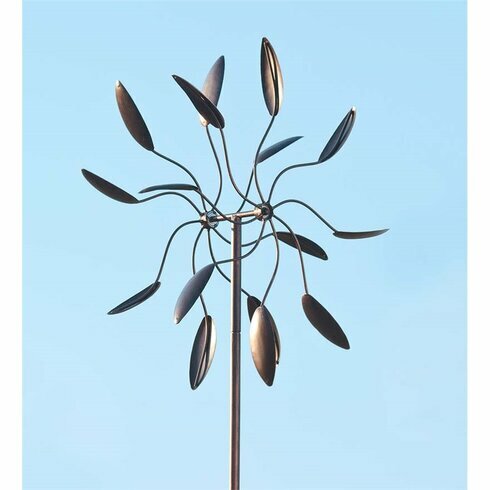 Designed to add movement to garden decor, kinetic wind sculptures are beautiful pieces of art that incorporate the clever use of sculpted pieces which spin in different directions with the blowing wind. The design of these sculptures can range from simple to intricate and the price range varies just as much. Expect to pay anywhere from a few dollars to several hundred dollars for the larger pieces. No matter the design or price, each unique piece adds its own elegant touch to garden decor. As you browse through this article, you will find that there is something to suit all tastes and budgets. 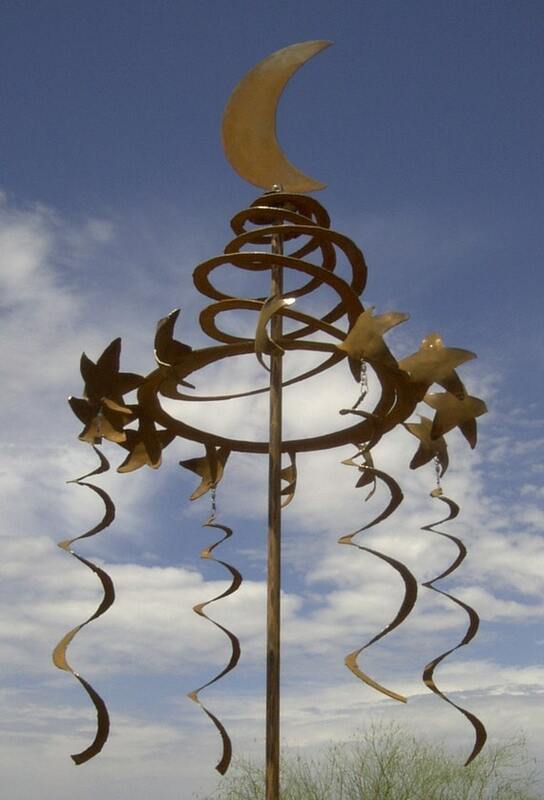 Consider giving kinetic wind sculptures as a thoughtful gift for anyone who loves their garden. They make the perfect gift for occasions such as birthdays, anniversaries or Christmas. These sculptures are not limited to garden use, but also make great additions to the patio or balcony. Kinetic art first made its appearance in the early 20th century. It is derived from the art movement known as constructivism. The sculptures and works of art that are referred to as kinetic art all involve some type of movement. Pieces are three dimensional and made in such as way that their appearance is enhanced through the movement and plays a key role in the visual appreciation of the piece. When kinetic art pieces are used as garden decor, the motion for the piece is provided by the wind. These types of mobile works of art are sometimes referred to as spinners or whirlygigs. Many artists have been inspired by kinetic art including Marcel Duchamp, Alexander Calder and Theo Jansen. The most difficult challenge to adding a large wind sculpture to your landscape is finding enough room. Keep in mind that you shouldn’t limit yourself to actual garden space, that adding a wind sculpture to the front or back yard or even near the front door of your home can make a welcome addition. Just be sure that the sculpture is placed in such a way that it has room enough to move and spin freely. Here we take a look at one artist, Anthony Howe, and see how he creates his amazing 3D otherworldly kinetic sculptures from steel. The artist first uses a computer to create his designs in 3D so he can have a visual as to how the piece will move. This video shows some of his creations. These great pinwheel styles are reminiscent of a favorite childhood toy. Add fun and whimsy as well as motion to any garden or landscape. You can also use them to teach children about the power of wind. This sculpture creates an eye catching display in any garden setting with its two sets of blades that spin in different directions along with the movement of the wind. Powder coated steel provides long life while at the same time providing a verdigris effect as piece weathers gracefully over time. Piece is 75 inches tall by 22 inches by 8 inches. Makes a great gift for gardeners and anyone who loves gardens. 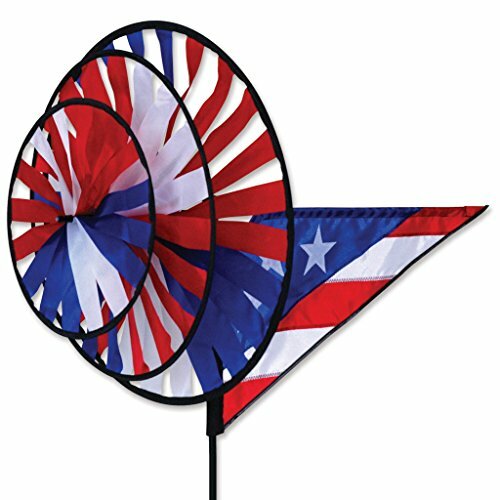 This fun wind spinner is perfect for patriotic holidays such as Memorial Day, July 4th or Labor Day, or to show your patriotism all summer long. Click through for more patriotic wind spinners that you can add to your garden for summer. Looking to add not only motion, but some color to your landscape as well? These spinners offer both motion and color. This confetti wind spinner is constructed from metal and has beautiful colors that form a beautiful flower when spinning. The design itself resembles peacock feathers. Spinner stands over six feet tall, with a 24 inch diameter. Curving radial lines interlace with circles of metallic color, making this sculpture an imposing piece of beauty when used in any landscape. You can see it in action below in this video. This tulip garden stake is part of the Kinetic Garden Art Collection and features an animated design of a tulip. Green in color with a powder-coated metal finish, stake measures 72 inches high by 18 inches wide by 18 inches in diameter. 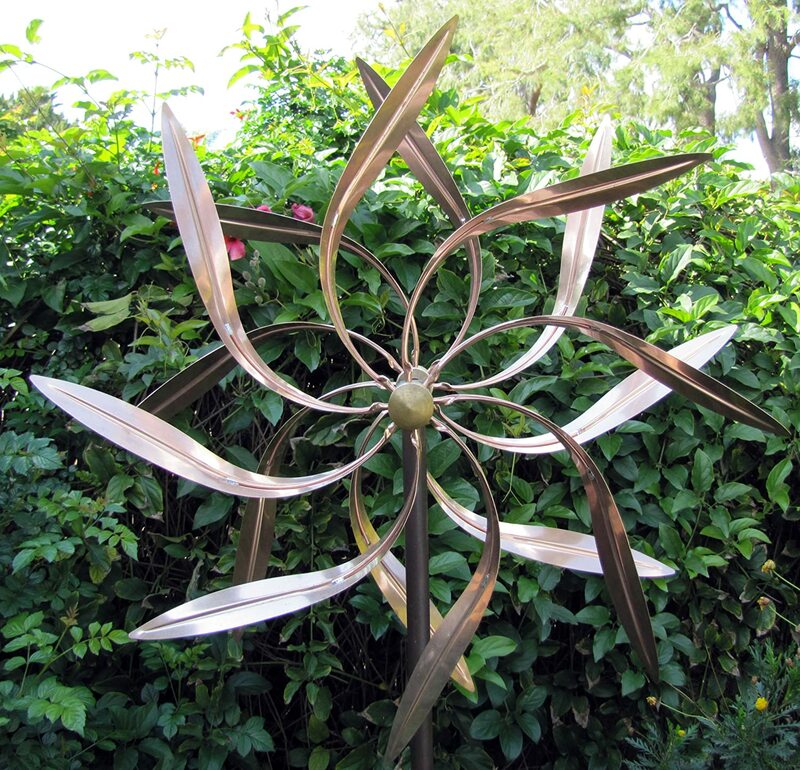 Part of the Kinetic Garden Art Collection, this spinner measures 84 inches high by 30 inches wide by 28 inches in diameter. Item is red in color and made from metal. Delightful garden accent or stand alone piece, watch as the two sections of the red flower design spin with the movement of the wind. The design of the kinetic wind sculpture allows the blades to move in various directions when the wind catches it. 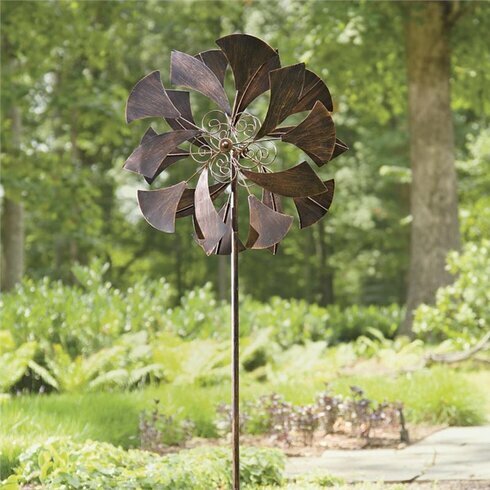 This beautiful spinning sculpture is made from weather resistant copper that will weather naturally over time and provide decades of lasting beauty. If you’re not a huge fan of the weathered look, keep it looking like new by coating it with a clear colored preservation coating. Sculpture stands around six feet tall with each wheel being around two feet wide. Made from pure copper and brass, this sculpture is 6 feet tall and features heavy duty construction. Head of spinner measures 24 inches in diameter. Moves with the slightest breeze and features extremely detailed and impeccable craftsmanship. Perfect addition for any garden setting. 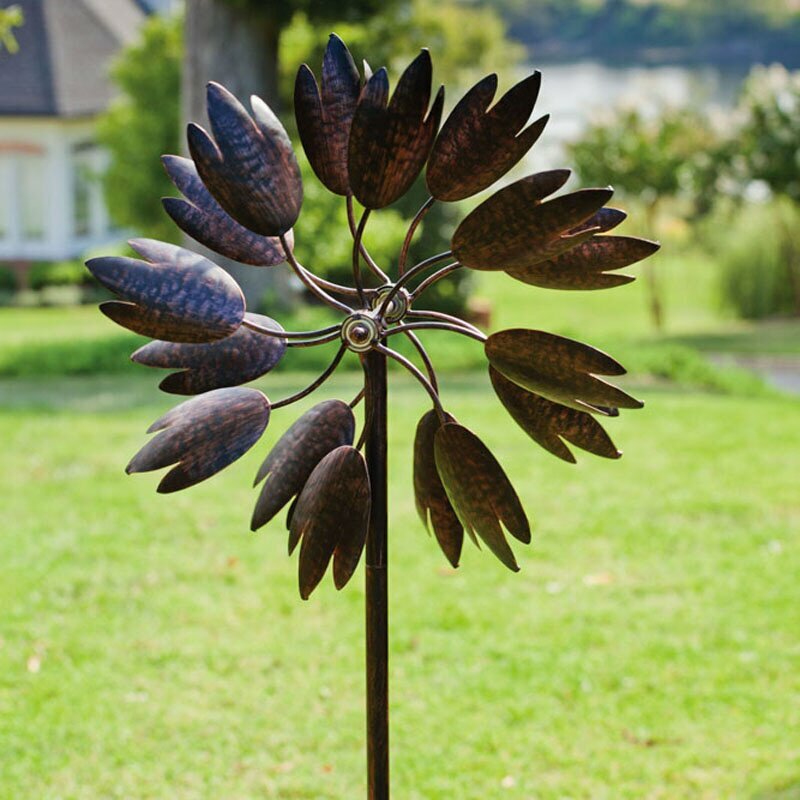 This Metal Ginkgo Leaf Wind Spinner with antique bronze finish is an elegant addition to any outdoor living space or patio retreat. Producing an enchanting display of wind-powered movement, this metal spinner features two rotors with ginkgo-like leaves that twirl easily around a center axis accented with whimsical metalworking. These unique wind wheels can spin both directions, independently of each other, for a mesmerizing effect. The antique bronze, weather-resistant finish gives this piece of kinetic yard art a worn, aged appeal. Browse through these other selections for a sampling of the various styles offered in large kinetic wind spinners. With so many styles to choose from, there is something for everyone. The “spoon” shaped wind catchers on this kinetic wind spinner are designed so that it moves with even the slightest of breezes. Each wheel moves independently for a great effect. Metal is sealed with a weather resistant antique bronze finish. Stands over six feet tall with a 29 inch diameter. Watch it in motion on the video. 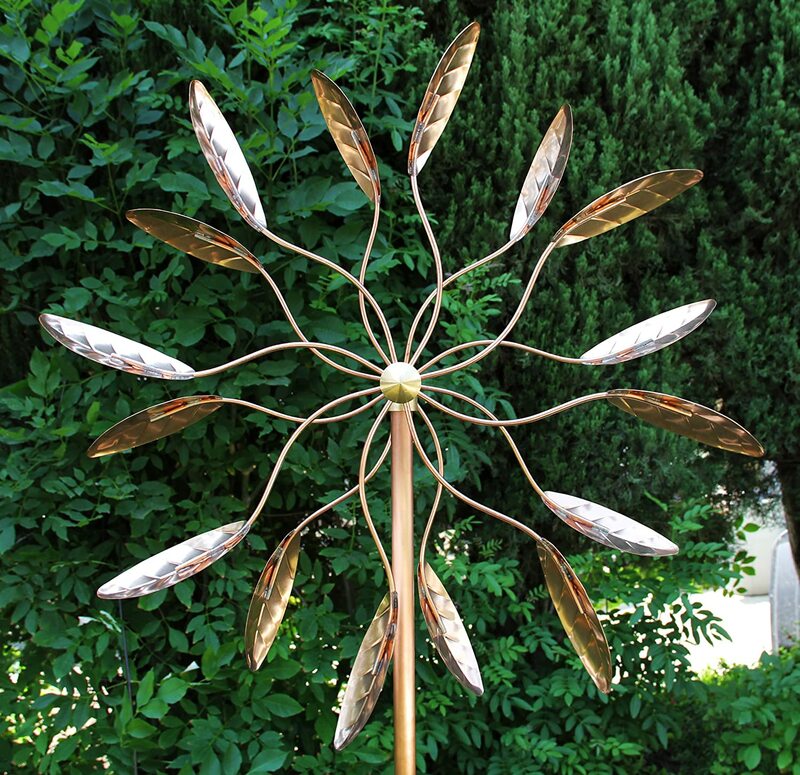 Crafted from weather durable metal and sealed with an antique copper finish, this wind spinner stands over six feet tall and has a 25 inch diameter. Features spoon-like leaf wheels that move independently. Makes a great garden accent piece or can be used as a stand alone accent. This video captures how the spinner moves. Spinner stake features counter facing wind cups that catch the wind and rotate by perpetual dual motion. Glows in the dark through luminescent crystals in the hand-blown art glass globe absorbing energy during the day, making it glow at night. Weather resistant electroplated painted copper finish stands up to the elements for many years of enjoyment. Stands 48 inches tall and is 16 inches wide. Looking for a handcrafted piece that is made to order? Consider buying from an artist on Etsy. This is a made to order, handcrafted item made from steel. The Petite Celestial Wind Spiral sculpture features a double coil at the center which allows it to bob up and down in the event of strong winds. This piece rocks, bobs, and features four independently spinning tassel coils. Sculpture stands six feet tall and measures 32 inches from the top to the bottom of the actual sculpted piece. To see this sculpture in action, watch the video below. 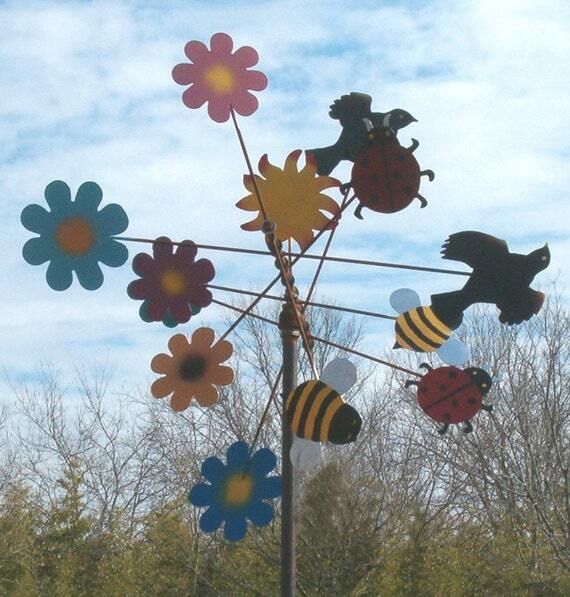 This mesmerizing wind spinner features birds, bees, flowers and sun with six spinners that rotate. 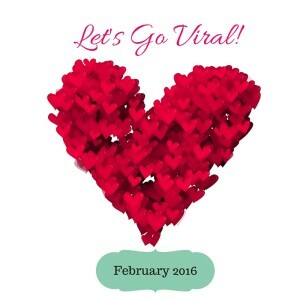 To see it in action take a look at the video below. So many choices. So hard to choose. Which one is the right spinner for your garden? Do you prefer color or monotone?